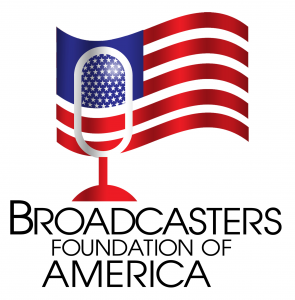 As you can see, the Broadcasters Foundation of America has a new logo, new look and a brand new website at broadcastersfoundation.org! Before you think all this is merely window dressing, please remember it’s for the essential national charity you know well. Our altogether unique mission of helping our own fellow broadcasters when life turns sad and difficult remains the same. The Foundation, which assists broadcasters past and present all across the country, remains our profession’s only real “safety net”. Call it selfish if you will – we help only those who labor in our industry and are hurting and almost forgotten, those who have been laid low by unforeseen circumstances, natural disasters and personal medical emergencies. Your yearly support enables the Foundation’s humanitarian assistance for both those who appear before the microphone and in front of the camera, as well as their colleagues behind the scenes, who bring the programs to our listeners and viewers. With your help, we’ve also been there for broadcasters whose lives and families have been devastated by hurricanes, fires, floods and all manner of natural disasters. For example, after recent flooding in Louisiana, thanks to your contributions, we were able to quickly dispense close to $100,000 in Emergency Grants to help families get back on their feet. Be assured that every pleading and petition for assistance is relentlessly vetted and verified by our Board of Directors, many of whom you know. They’re doing some of the best work of their lives for your Foundation and they will gladly confirm for you just how many of our colleagues are in real distress as a result of life’s unforeseen medical emergencies. We know you do a lot for so many in your own hometown and community. But as you have been a great leader in our industry and are well known in the profession you have distinguished for so long, we pray our unique charitable work and Mission will resonate in your generous heart. What is it about the Broadcasters Foundation that makes it so special and altogether unique? Well, for one thing we do have that clear and definite bias. We “Take Care of Our Own”. It is our mantra and our theme. It’s why we exist. Many of our recipients were cut down in the prime of their lives by illness or sudden catastrophic episodes for which their families were ill-prepared. Some were almost destitute and we’ve continued to assist spouses struggling to hold shattered families together following an untimely death. So, again this year, as is our custom, we make only this one Annual Plea on their behalf. In recent years, contributions to our all-important Guardian Fund have ranged from just a few, much-appreciated dollars to well over $50,000 from several individuals. And while we realize not everyone is capable of such magnificent generosity, we acknowledge our hope that this year you will consider a substantial gift. And many individuals in the past have designated their contributions as Memorial Tributes, in the name of past associates, family members and life-long friends. Among those honored are Tony Malara, Ward Quaal, Ron Ruth, Rick Buckley and Stu Olds. So, we beg your urgent support as our colleagues confront those awful personal chapters life sometimes bestows, unbidden, when we least expect it. All major gifts to the Guardian Fund are gratefully acknowledged in our Annual Report, widely distributed to several thousand broadcasters, community and corporate leaders and media professionals all across the nation. Individual and Corporate contributions are fully deductible and may be made to the Guardian Fund of the Broadcasters Foundation of America, your profession’s officially certified and registered 501(c)3 national Public Charity.